With special thanks to Leslie Myrick of the Mark Twain Project at Berkeley for recovering the text of "Abou Bill Barnum" from historical newspaper archives. In the presidential election of 1880, Mark Twain supported the Republican ticket of James A. Garfield over that of Winfield S. Hancock. A few days prior to the election, a letter that was later deemed to be a forgery was circulated across the country. The letter was a forgery of Garfield's handwriting and signature and indicated that he was sympathetic and in support of Chinese immigration -- a stance sure to inflame voters against him. It was published at a date so late as almost to preclude efficient exposure of the forgery. William H. Barnum was chairman of the Democratic National Committee and accused of helping to spread the forgery across the country even though he had knowledge that it was likely a false document. The Republican party was able to counter the accusations contained in the letter in a last ditch effort and pulled out the election for Garfield in one of the closest elections in the country's history. 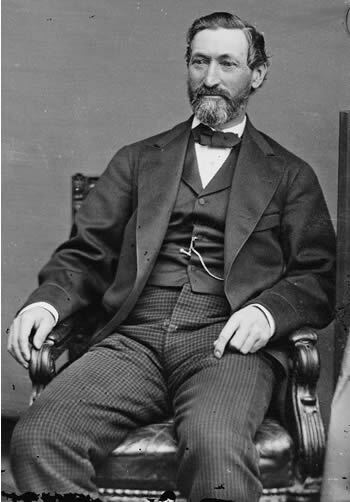 William Henry Barnum (1818-1889), a cousin to showman P. T. Barnum, served as both a representative and senator to Washington from the state of Connecticut. He had previously earned a nickname among Republicans as "Seven Mule" Barnum because it was reported he had used those code words in a dispatch requesting "seven thousand dollars." He was chairman of the Democratic National Committee in 1880. On November 2 Mark Twain gave a speech in Hartford celebrating Republican victories and referred to the "Forgery, A Farce" in a speech dubbed by the press as a funeral oration for the Democratic party. On November 6, 1880 Mark Twain traveled to Boston to the Middlesex Club to again celebrate the Republican victory. The Middlesex Club continues to be one of the oldest organizations of Republicans in the United States dedicated to preserving the memory and ideals of Abraham Lincoln. Accompanying Twain on the trip was Marshall Jewell, a former governor of Connecticut and chairman of the Republican National Committee. Also present at the occasion were Governor John Davis Long of Massachusetts, Alanson Wilder Beard, newly elected congressman Ambrose Arnold Ranney of Massachusetts, Governor Nathaniel "Natt" Head of New Hampshire, and Col. Daniel Needham. Tom Karl, manager of the opera company "Bostonians" sang. Newspapers across the country reported on Mark Twain's speech and his parody of the poem written by James Leigh Hunt in the 1830s titled "Abou Ben Adhem." Newspapers around the country carried segments of Mark Twain's speech and his poem. To date, (St. John's) The Newfoundlander, 26 November 1880, p. 1 seems to be the most complete version yet available and is the text reprinted here. The chairman introduced, as the representative of Connecticut, Samuel L. Clemens, the man who gave an account of the "Innocents Abroad," and who he hoped would give an account of the innocents at home. [Three cheers, the company rising.] . The President -- You are, sir. Mark Twain -- Am I? Exactly. I thought you mentioned somebody else. I was going to say I was the only person here who wears the Connecticut sign and symbol of intellect and moral advancement upon his shoulders -- a wooden nutmeg; and I would take it upon myself to represent that state. Perhaps, as you are so far away, you haven't heard that we carried that state for the Republicans, with 2,000 or 3,000 or 7,000 majority, or somewhere along there (I am not sufficiently acquainted with politics to keep up in figures), and three congressmen out of four, and the Governor and Mayor, if we elected a Mayor; and, what was the biggest triumph, we elected seven sheriffs out of eight (laughter), and that is as it should be, because the criminals and officers ought to be of opposite parties. (Loud, long continued and renewed laughter.) Yes, Mr. Chairman, in spite of all my political speeches, and of our friends, in behalf of the Republican party, I think Connecticut has done very well -- has done very well. I did not obstruct the cause half as much as I might have supposed I might in a new career, politics being out of my line. But it was a great time. The atmosphere was thick with storm and tempest, and t here was going to be a break, and everybody thought a thunderbolt would be launched out of the political sky. I judged it would hit somebody, and believed that somebody would be the Democratic party, and that it would hit them faithfully. I did not believe we had much to fear on the Republican side, because I believed we had a good and trustworthy lightning rod in James A. Garfield. (Laughter). We are not through yet. We have only secured a part of our triumphs. We have been sorrowfully conspicuous in times past, and intend to send a new representative to the United States Senate, because Mr. Eaton has been rather an unfit man -- not to put it too strongly. (Laughter.) In times past we have been represented in that Senate by a man who has made himself immortal as -- well, I won't call him hard names -- William H. Barnum -- but with all his rascality, and that is a mild term (laughter), he failed -- he failed (applause), and has got to be conspicuous to the end of his life as the man who has simply made Jack Sheppard* respectable. (Laughter and applause.) He failed, and a now a Legislature composed of a majority of Republicans -- a small majority, 94, I think it is -- will send a United States senator to this coming session; and we all believe that man will be that good soldier, and wise man and pure man, that able man and statesman, General Joe Hawley (loud applause), unquestionably the ablest and most eminent man in Connecticut except me. (Laughter.) But I am through by necessity, because I cannot recollect the things I was going to say since I have been sitting here. I will think of them tomorrow when they will be too late, and think of much better things too. That is the experience of every man. But to return to the late William H. Barnum. As I do not make a speech and never write poetry, I thought I would do both this time, and I have written a poem for this occasion. Well, I think I had better not say that, because, if it gets into print, it might be found I had deflected a little from the truth. But I have paraphrased a poem. It isn't exactly a parody, because I use all the language that Leigh Hunt used in his poem originally, "Abou Ben Adhem." I have simply just altered a few words to fit the present time and circumstances, and Mr. Leigh Hunt is dead and won't mind it. [Laughter.] It is entitled ABOU BILL BARNUM. (The Newfoundlander, 26 Nov. 1880). At this point, Mark Twain read his parody. It is presented here side-by-side with the original version by James Leigh Hunt. Answered, "The names of those who serve the Lord." Write me as one that serves his fellow men." And, lo! -- Bill Barnum had "got left!" (Cincinnati Daily Gazette, 13 November 1880). The Hartford Daily Courant of November 13, 1880 in an article titled "Boston Correspondence" reported "Mark Twain was in a good mood for the most part, though I am inclined to think that on calm reflection he is himself convinced that it would have been as well for him to let Abou Ben Adhem alone." This was not the first time that Mark Twain had written a parody of Hunt's poem. His personal notebook for September 1880 contains the parody "Abou Ben Butler" (Mark Twain's Notebooks and Journal, vol. 2, p. 372-373). The following month Bill Barnum was featured on the cover of Harper's Weekly toting the heavy burden of the forged Chinese letter. Anderson, Frederick, Lin Salamo, and Bernard L. Stein, eds. Mark Twain's Notebooks & Journals, Vol. II. (University of California Press, 1975). "Boston Correspondence," Hartford Daily Courant, 13 November 1880, p. 1. Branch, Edgar M., Robert Hirst, and Harriet Elinor Smith. The Works of Mark Twain: Early Tales & Sketches, Vol. 1, 1851-1864. (University of California Press, 1979). "Current Notes," Boston Daily Journal, 8 November 1880, p. 2. Davenport, John. History of the Forged Morey Letter. (New York, 1884). Online via google books. Gribben, Alan. Mark Twain's Library: A Reconstruction. (G. K. Hall & Co., 1979). "Jollification," Chicago Daily Tribune, 7 November 1880, p. 2. "Mark Twain Before the Middlesex Club," Cincinnati Daily Gazette, 13 November 1880, p. 6. "Mark Twain in Politics," (St. John's) The Newfoundlander, 26 November 1880, p. 1. Norton, Charles Ledyard. Political Americanisms. (Longman's, Green & Co., 1890). Online via google books. "Political Notes," Hartford Daily Courant, 9 November 1880, p. 2.